HO CHI MINH - CoderSchool, established in Ho Chi Minh City by Silicon Valley founders in 2015, has raised anundisclosed seed funding round from Singapore-based Tri5 Ventures to train and upskill world-class software developers in the emerging Vietnam tech scene. The funds will be used to relocate to a larger campus in Ho Chi Minh, grow the business and instruction team, as well as expand to other Vietnamese cities of Hanoi and Danang. CoderSchool aims to train and place a target goal of 1500 developers in the 3 major cities, Ho Chi Minh, Hanoi, and Danang in the next 3 years. According to a VNExpress article, the number of tech jobs have risen over the last three years. Vietnam currently employs 250,000 engineers and the estimated demand estimated is expected to be 400,000 by 2018. A survey showed a 2-year experienced engineer is estimated to earn a maximium of US$1,160 per month and looks set to rise further. The Vietnamese startup ecosystem is growing at an accelerated pace. In a recent report by Vietnam Briefing, 39,850 new startups were incorporated in the first four months of 2017 alone. The Saigon Silicon City Center will be a startup hub to incubate startups and expected to attract over US$1.5b in investments by 2020. The fintech industry has also received US$129m in investments. CoderSchool is founded in 2015 by Charles Lee and Harley Trung, two computer science graduates who hail respectively from UC Berkeley and Yale in Silicon Valley. Since then, the school has conducted 23 programming cohorts with 312 graduates. Charles Lee says, “There’s an obvious global shortage of engineers, but it is even more pronounced here in Vietnam due to strong demand from overseas. Vietnam may be the best place in the world to find hardworking, talented young engineers. Salaries are rising but are still dramatically lower than other parts of the world. CoderSchool alumni have gone on to work at leading tech companies such as Uber, Grab, Fossil, TinyPulse, Lazada, Okiela, Sentio, Saleshood, Zalora, Mingle, Wizeline, 2359 Media, and Silicon Straits. Coderschool is founded in 2015 by Charles Lee and Harley Trung, two computer science graduates who hail respectively from UC Berkeley and Yale in Silicon Valley. Since then, the school has conducted 23 programming cohorts with 312 graduates. 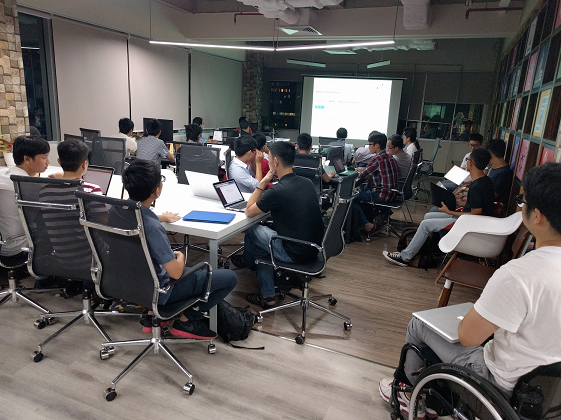 CoderSchool alumni have gone on to work at leading tech companies such as Uber, Grab, Fossil, TinyPulse, Lazada, Okiela, Sentio, Saleshood, Zalora, Mingle, Wizeline, 2359 Media, and Silicon Straits. CoderSchool’s curriculum, originally developed in Silicon Valley, is based around real-world examples, multi- modal learning, and carefully-spaced repetition. In addition to several weeks of discussion, lecture, and hands- on lab time, students spend much of their time building real-world applications from scratch. About TRi5 Ventures Tri5 Ventures is a Singapore-based early-stage Venture Capitalist which invests in South-East Asian technology startups. It has recently made a US$220k investment into UpCode Academy, a Singapore-based programming school. SINGAPORE – ATHLEDE Pte Ltd, a sports lifestyle hardware tech company, has received a S$40,000 angel funding and Startup SG founder grant from TRi5 Ventures to develop training assistance wearables that do more than just tracking people’s exercise and fitness. TRi5 Ventures is an Accredited Mentor Partner of SPRING Singapore. ATHLEDE is co-founded by Kwok Cheong WONG (KC), a graduate of SIM’s Platform E IntensE entrepreneurship programme and his programme mentor, Dr Bert Grobben. Dr Grobben is also CEO of Venture Builder Budding Innovations. Refash, a fast fashion resale and hybrid retail platform for women to buy and sell pre-loved clothing items, announced that it has raised a seed round of S$400,000 (US$294,323). The round was led by Tri5 Ventures, with participation from Malaysia-based Tinkbig Ventures and an undisclosed angel investor.